Smart phones not only put advanced photographic capacity into the hands of everyone who owns one, but also an ability to record amazing videos. An emerging research literature is documenting the power of these technologies in taking science communication to the next level. I have been posting home-made science communication videos, made with iMovie, on my Vimeo channel for several years. For me, there was a much greater learning curve associated with Vlogging for science communication, compared with, say twitter or blogging. I still find it a slog, probably because I haven't done it enough to become well-practiced. Nevertheless, since a blogging and vlogging are emerging as a theme in these last nine lab blog posts for 2018, I do want to emphasize that it really IS relatively simple to make a short VLOG. Also, in making my recent Advent Botany VLOG, I learned that it's pronounced vah-log, not vee-log, because, as my daughter, explained, "we don't say bee-log, mum ." Recently, Biology Professor, Dr. Patricia Lakin-Thomas contributed an excellent 1.25 minute video explaining the innovative zero-credit Biology research practicum course, to our keynote talk at the Teaching in Focus Conference on December 5th, 2018. The York University Biology Research Practicum Course from Dawn Bazely on Vimeo. York University's annual pedagogy conference has taken place each May since 2013. Prior to this, the Centre for Support of Teaching (CST), which the Teaching Commons replaced, organized annual pedagogy conferences and workshops, of which I was an enthusiastic participant. You can see a screen cap about the CST at the end of this post. 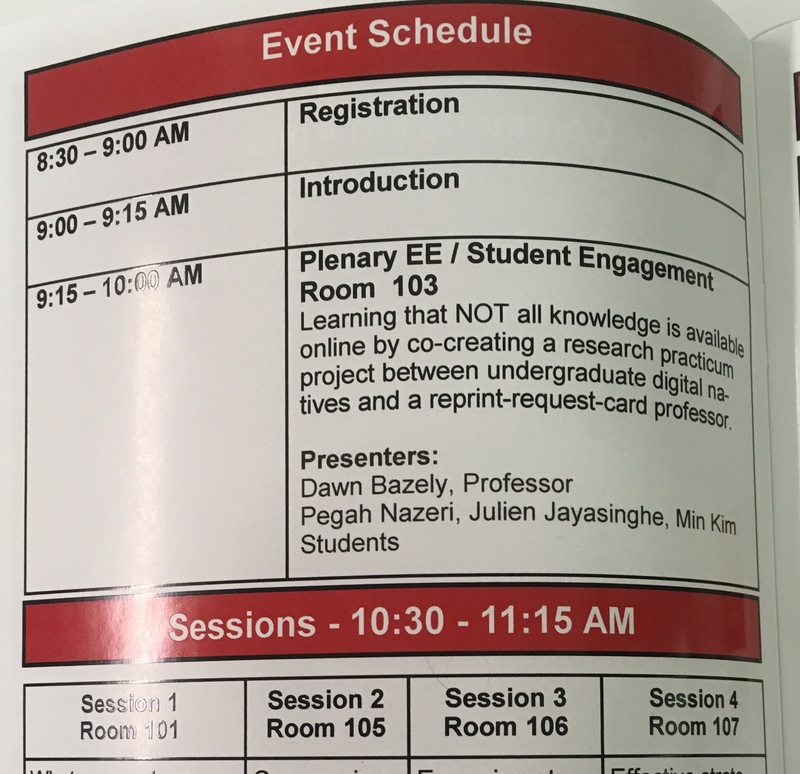 How did three Biology undergraduate students come to be co-presenters in a Keynote Plenary at the rescheduled 2018 Teaching in Focus conference? In September 2017, research practicum students, Pegah Nazeri and Julien Jayasinghe, and I met with Prof. Celia Popovic, who was, until December 2018, director of the Teaching Commons. We wanted to discuss the possibility of co-presenting our summer 2017 Research Practicum project as a talk, at the May 2018 annual conference. Celia was very taken with our Academic Decluttering project, because it fit well with the conference theme of "Student Engagement". She told us that our project was suitable for one of the plenary talks! Unfortunately, I learned while I was a visiting professor in India and Australia, that the conference had been canceled, due to this year's CUPE strike. We were thrilled to hear that it was rescheduled for December 2018. Having an extra six months to work on our talk allowed us to improve it immensely! We presented a project that involved nine students volunteering in the summer of 2017, through the zero-credit Biology research practicum course. This is an important vehicle for student engagement in Biology, which is why I invited its founder, Professor Pat Lakin-Thomas, to make her short VLOG explaining the course. 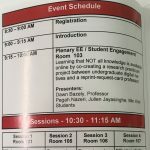 Recently, as we were finalizing our talk, I realized that undergraduate students, who haven't attended many academic conferences were unfamiliar with terms like plenary and keynote talks. This revealed yet another aspect of students learning how science and academia works, this time, with respect to conference organization and structure. Here is the abstract that we submitted, which included all participating Biology Research practicum students, and also the two Independent Studies students who worked on the project, as co-authors. And here is our talk: Not Everything is Digitized! 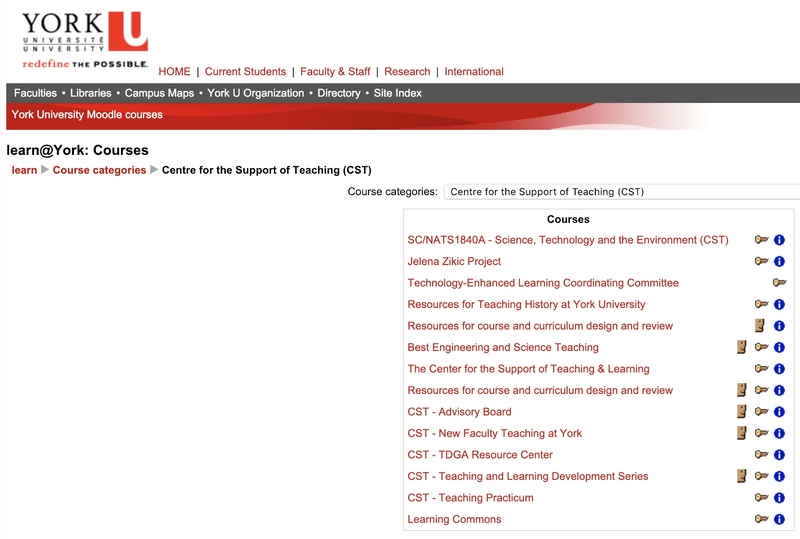 Finally, below is the only evidence that I could find on the York University website about the existence of the long running Centre for Support of Teaching from which I learned so much about pedagogy, when I joined the York University faculty in 1990. I will deal with the topic of link rot and curating and archiving of knowledge in future 2018 posts.